Those boys at Engadget do it again! They get a side by side comparison video of both the iPhone 5 and the Lumia 920. 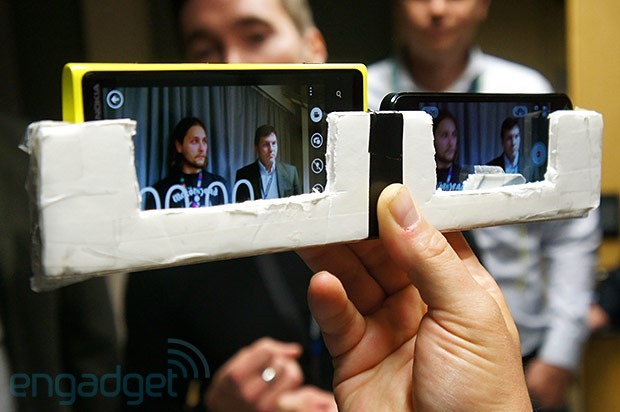 Make sure you hit the “HD” button on the video – the Lumia 920 takes the cake, no question about it! Wow. That really makes a difference. The iPhone 5 shakes like a 2 year old at a midnight showing of the Texas Chainsaw Massacre. 920 for being able to recognize whatever you are fleeing from in the video after getting away… even if it was just a dirty squirrel. I think they are both pretty equal. The iPhone seems to have more light where the Lumia is a little darker. I think it is dead even, which for anyone is a Win for Microsoft! 920’os hands down better. Way steadier and offers real-life lighting. The iPhone 5 isn’t bad, but tries too hard to brighten up the picture and has zero tolerance for shakiness. I hope OIS becomes standard across all WP8 devices! It’s awesome. This is the phone that they call the iPhone killer? I need somebody to explain this to me…. The camera is slightly(grain of salt) better. And it has NFC…. Which 95 percent of people dont evan know or care what it is. A bigger screen? Well the galaxy note has a bigger screen than the iPhone does that make it better? besides, its not an “iphone killer” that makes this an iphone killer. Its the first real competition with a chance that makes it an iphone killer. I agree with Ramon Trotman, tread carefully my friend. The Lumia 920 was never sold as an “iPhone killer”, and as for the two new features you mention above they are not the only ones, I believe there are about 8 new features, but I culd be wrong. Off the top of my head my favorites ones are, the wireless charging, the Lumia also boasts the Nokia City Lens, and augmnted reallity software (can’t wait to use this for when I hit the town on the weekends), the phone also comes with Synaptics ClearPad touchscreen, which it turns out you can operate while wearing gloves, ohh and you can’t forget the free of charge turn-by-turn voice guided navigation, that you can use without the need o internet. And I’m glad most if not all of these features are integrate into the OS itself, I was really getting tired of the whole “there’s an app for that” bull$h!+ that Apple had come to establish and everyother competitor was trying to match. So yes the Limua 920 isn’ the “iPhone Killer” but it sure as hell comes close to it. I’m just glad someone is bringing something new to the sartphone game, and it isn’t Apple this time. I feel kind of bad for Wozniak, even he hates his iPhones.